Bed frames are stand-alone foundations that support and hold up mattresses off of the floor. Although there are a variety of options available, each kind of bed frame shares similar traits — including a sturdy frame that supports the edges and weight of the mattress. Bed frames are designed to provide balanced and dependable support for mattresses, so mattresses can perform at their highest level to give sleepers the support they need and comfort they prefer. Bed frames are just as important as a quality mattress in helping you get a good night’s rest. They not only add design and style to a bedroom, but most importantly, they serve a pivotal purpose providing a foundation to support your mattresses and you. In addition, bed frames help prevent heat trapping and reduce noise. The most common bed frame, that’s been popular for many years, is actually a combination that includes a traditional low box spring platform and a standard metal bed frame. We will also provide a comprehensive overview of the top bed frames on the market based on research and consumer reviews. Bed frames are usually constructed with wood or metal, and can include head, foot, and side rails, and support bars or slats. The head, foot, and side rails surround the entire mattress to provide support for every edge of the mattress. Support slats are designed to run vertically and horizontally across the bed frame to provide added support for the mattress. In this guide, we will explore bed frames in two categories: standard bed frames and platform foundation bed frames. Standard bed frames are made to be used in combination with a box spring, and include only head, foot, and side rails, and maybe an additional support rail or two. Platform foundations are constructed with similar head, foot, and side rails, plus many support slats for additional support. If a platform bed frame is constructed with slats no farther apart than 2-3 inches for support, a box spring is typically not necessary. A platform bed frame provides the support that a box spring and standard metal bed frame does. Each mattress needs a solid foundation underneath to absorb movement and offer support, and manufacturers include requirements for each mattress model. See if you need a box spring in our Box Spring Guide. Mattress stores typically sell mattresses with the box spring foundation as a set. You don’t have to have a matching set, however. You can buy the mattress separately from the box spring or foundation sold to match the mattress. If it’s right for your mattress, skip the box spring or matching foundation and save money, and choose your own platform bed frame for your mattress. Mattresses do need a foundation for support, and the floor does count as a foundation. However, the floor may change the feel of the mattress, and some warranties won’t cover mattresses that are used without the suggested foundational support, like a platform bed frame or standard bed frame and box spring. A good bed frame provides consistent and solid support for the mattress so the mattress can perform well. The best bed frames also help to reduce noise. They also stay stable and reduce motion transfer that occurs when sleepers move on and off of the mattress. Lastly, a bed frame should offer an aesthetic that matches the look and feel of the bedroom, and can offer additional storage under the bed. What room will the bed frame be used in? What kind of frame will go with the decor of the room? 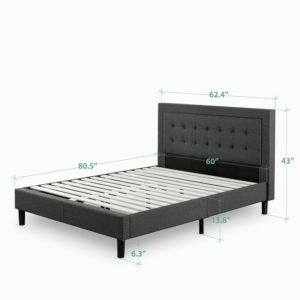 Is the bed frame easily transportable? There are many, many types of bed frames, and we while explore the most popular and best kinds of bed frames in this guide. Bed frames range from standard metal frames, to wood platform beds, to platform bed frames that have built in drawers for storage, for example. A standard metal bed frame is constructed with head, foot, and side rails, and may include a few additional support rails or slats. These bed frames are durable because of the steel material used, and don’t bend, sag, rot, or warp with age. They provide sturdy support for the mattress and elevate the mattress from the floor. 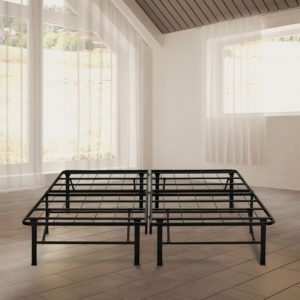 These standard metal frames require a box spring, as most standard frames do not include any or few support slats to provide additional support for the mattress. The box spring provides the support the mattress needs, and the bed frame supports both, and raises the profile of the bed. If a mattress is placed directly on the bed frame without the right support, the mattress could sag, warp, or fall between the frame support rails. 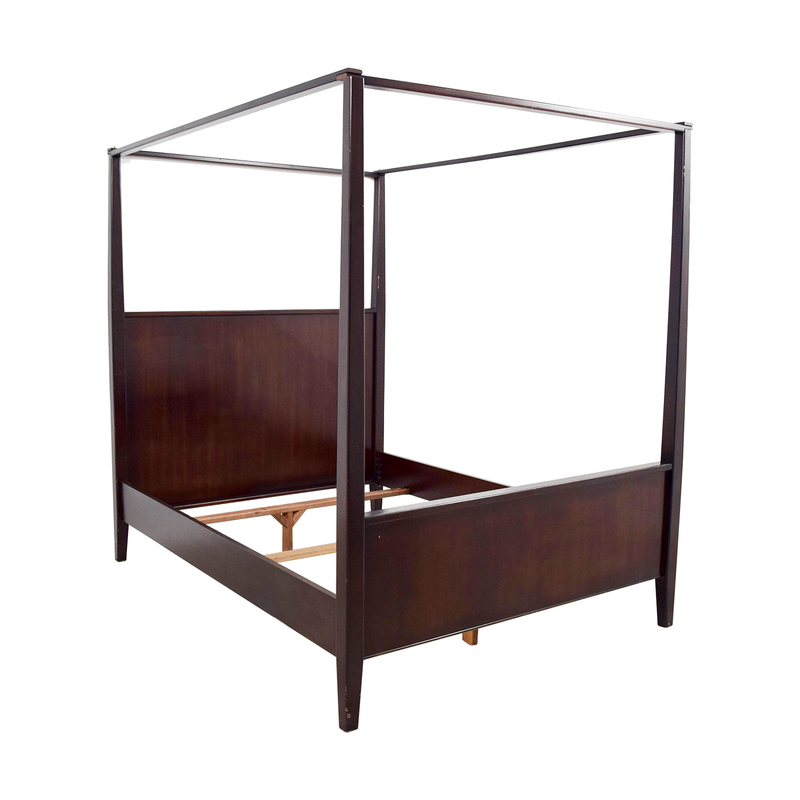 Because of the construction style of the standard metal frames, it is recommended that a box spring be used. The box spring sits on the metal bed frame, and the mattress is placed on top of the box spring.Mattresses require more support than what the standard metal frame with limited to no support slats alone can provide. It is also recommended that these standard frames are used for innerspring mattresses. The coils of the box spring work in conjunction with the innerspring coils, and can help absorb body weight, adding to the support of the mattress. This bed frame will support several varieties of sleepers (combination sleepers, side sleepers, back sleepers, stomach sleepers) and provides support for mattresses that are paired with a box spring and innerspring or innerspring hybrid mattress. 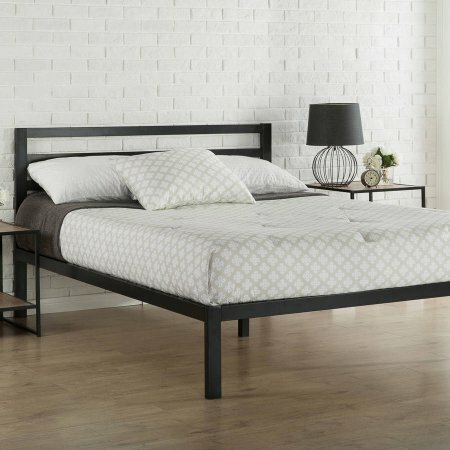 These bed frames range in cost from $50 to $150. These are the least expensive bed frames available on the market. However, sleepers should consider the cost of a box spring as it will be necessary with this kind of bed frame. Standard metal bed frames constructed with steel are extremely durable, and last many years. They provide sturdy foundational support for the box spring and mattress, and can stand up to heavy weight and movement. They don’t deteriorate over time, as compared to wood or other materials. These frames are known for being tough, and can also withstand being moved and re-installed over and over again. Although extremely durable and sturdy, these bed frames are the least visually appealing of all the bed frames, due to their utilitarian look and feel. 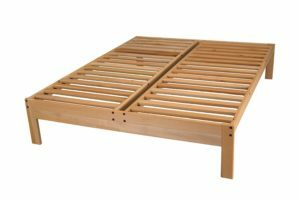 These platform beds include wood head, foot, and side rails that support all four sides of the mattress, along with wood slats that support the core of the mattress. These wood bed frames include a support frame for all sides of the mattress with support slats, and a headboard and baseboard, plus built-in drawers for storage. These bed frames include a support frame for all sides of the mattress, plus support legs, support slats, a decorative sleigh headboard, and low profile footboard. 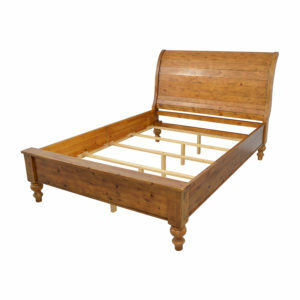 These wood bed frames are similar to the sleigh frames, although the headboard is mission-style. They include a frame that supports all sides of the mattress, and includes support slats and supportive wood legs. 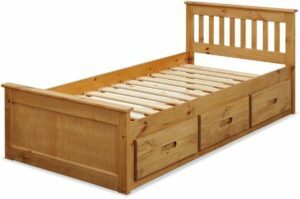 These bed frames include four main posts on the corners of the bed, and a frame that supports all sides of the mattress with support slats and supportive legs. These bed frames are similar to wood platform bed frames with support slats, but they are covered in fabric across the top of the foundation, and look a lot like box spring platforms. These frames are typically used with innerspring and memory foam mattresses. These bed frames are similar to the platform with support slats options, but also include a flat solid surface to support the mattress. They can include a head or footboard, or support legs. To support these mattresses, it is recommended that the wood slats are not more than 2-3 inches apart, to offer the most support possible and to prevent the mattress from sagging or falling in between the slats. These beds do not require a box spring, as they provide adequate support for mattresses. Because these bed frames work with a range of mattresses from innerspring to latex, they can benefit most sleepers. They support mattresses recommended for combination, side, back, and stomach sleepers. These bed frames can vary in price, depending on the quality and design. They can range anywhere from $130 to $2,500 for a queen size. These frames will be more expensive than the standard metal bed frames, but may offset the cost if purchased instead of a standard frame and a box spring. These wood bed frames provide consistent and solid support for mattresses based on their construction, which includes sturdy slats that hold up the mattress and strong wood frames that support all sides of the mattress. These platforms also prevent the mattress from sagging, which helps promote the durability of the mattress. While these are sturdy and durable bed frames, wood could splinter, rot, or warp over time. Wood platform bed frames have a lot of design appeal, and come in a variety of styles that can enhance a bedroom. Styles range from modern to classic to Mission (arts-and-crafts style). Metal platform bed frames are designed with a sturdy frame that surrounds all sides of the mattress plus many steel support slats that provide a sturdy foundation for mattresses. Metal platform bed frames are versatile and can be used with several different kinds of mattresses, especially memory foam, latex, innerspring, and hybrid mattresses. These frames offer sturdy support around the head, foot, and sides of the mattress, and added support from the metal slats or support bars that run horizontally or vertically across the frame. 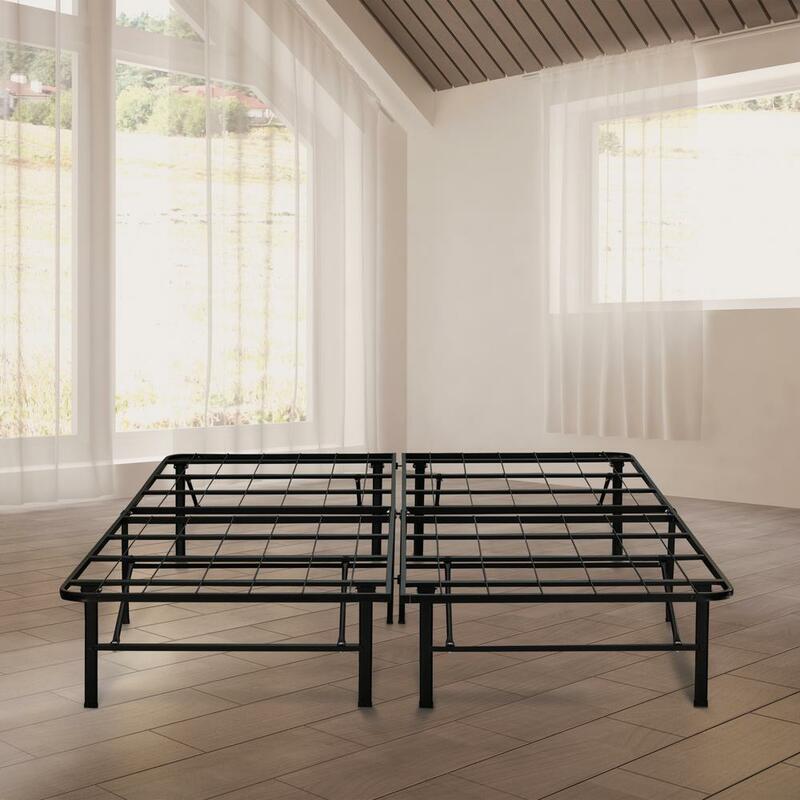 These metal bed frames support mattresses recommended for combination, side, back, and stomach sleepers, and are a top choice for heavier sleepers. They can support as little as 450 pounds or as much as 4,000 pounds, depending on the design and capacity. 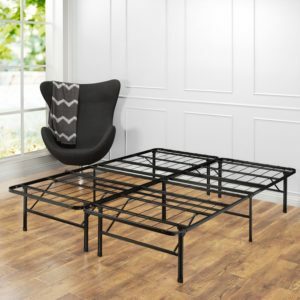 These metal bed frames usually cost anywhere from $65 to $500. Metal platform bed frames are built to withstand weight, and don’t bend, warp, or wear with age. These bed frames are made to last and the metal or steel material is naturally durable. Metal platform bed frames are more visually appealing than standard bed frames. These frames usually have more attractive support legs and are more sleek and modern in design. An adjustable platform bed frame lifts both the top and bottom of the mattress to adjust the position and shape for sleeping, reading, or watching TV. It is important to select an adjustable bed frame with both flexibility and durability in mind, and ensure that it is compatible with your mattress. The most adjustable bed-friendly mattresses are memory foam, latex, innerspring, and airbed mattresses. Memory foam and latex are the most flexible of these mattresses, and allow for contouring that is key in allowing the adjustable frame to work how it’s supposed to, and to meet a sleeper’s preferences. Because these beds are compatible with several mattresses, they can benefit a variety sleepers in the following sleeping positions: side, back, and stomach. These frames may not be as beneficial for combination sleepers who change sleeping positions frequently, as these bed frames can be difficult for moving. Adjustable bed frames can cost between $300 to $4,000, depending on the brand, quality, and functionality. Although they are durable and can last many years, adjustable mattresses do require some maintenance. Motors, remotes, and components may need to be replaced over time, and can be less reliable than the foundation or platform itself. These adjustable frames don’t change the look and feel of the room more than a regular bed frame does when the bed is in its flat position. They can, however, be larger than a standard frame and look bulky. Many of these adjustable frames require a special size of sheets as well. Now that we’ve discussed the different kinds of bed frames, we will explore the best platform bed frames and standard bed frames (in the next section). These top platform bed frames include wood and metal frames with support slats that serve as sturdy foundations for mattresses. All of these bed frame options were selected based on data available from research and third-party sources, along with findings from consumer reviews. The Zinus 14-Inch SmartBase Mattress Foundation is designed to be quiet, allow for under-bed storage, and offers a sturdy support foundation for mattresses. This bed frame is available in different bed sizes from Narrow Twin to California King, and is recommended for average weight people. These frames weight about 35 pounds and stand 14 inches off the floor. A deluxe version is also available, and is recommended for heavier people. Additional options include a custom bed skirt and headboard brackets that are specific for this bed frame. Durability: This bed frame should last a long time, and is constructed with a steel frame with reinforced metal edges that provide durable, sturdy support for mattresses. Legs with locking ability enhance stability. Installation: The Zinus SmartBase arrives in a compact shipping box, requires no tools for installation, and is fast and easy to assemble. 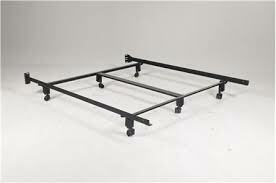 Its construction also makes the bed frame easy to handle, and disassembly is quick and simple. Under-bed storage: With 13 inches from the bottom of the support rails to the floor, the SmartBase bed frame allows for under-bed storage. Price: This platform bed frame is lower priced than other platform bed frame options. Different sizes available: The Zinus SmartBase is compatible with many different sizes of mattresses. 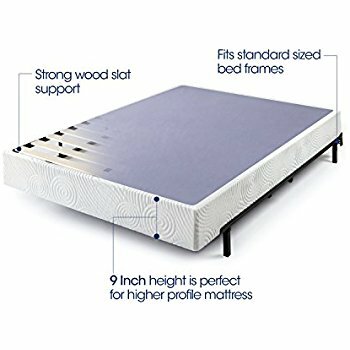 Appearance: Plastic caps are included on the support legs to help protect floors, and this bed frame helps raise the profile of the mattress. 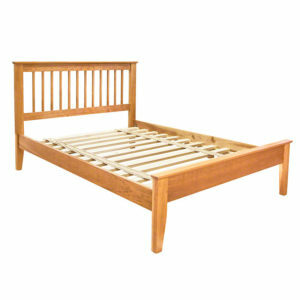 Warranty: This Zinus bed frame has a 5-year limited warranty. Quiet: The SmartBase bed frame is designed to prevent bouncing and noise when movement occurs. 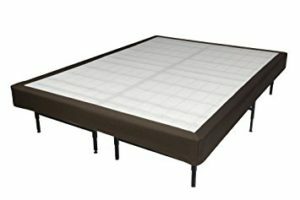 Purchase your Zinus 14-inch SmartBase Mattress Foundation from Amazon. The Zinus Upholstered Button Premium Platform Bed is designed to serve as a support platform for innerspring, latex, memory foam, and hybrid mattresses, and adds classic style to a bedroom. The steel bed frame is constructed with wood support slats that are less than 3 inches apart, to provide ultimate support for the mattress. The bed frame is surrounded by dark grey tufted upholstery fabric, and includes a headboard that is embellished with buttons. The bed frame is 104 pounds, and is available in sizes from Twin to King. Durability: This Zinus bed frame is designed to last a long time, and is constructed with a steel frame and wood support slats that are less than 3 inches apart to provide durable and stable support. The frame also includes 6 legs that support the mattress. Installation: Packaged in one compact shipping carton, this Zinus platform bed is easy and fast to assemble. Appearance: The Zinus Upholstered Button Premium Platform bed frame is stylish, adds to the bedroom design, and helps raise the profile of the mattress. The steel frame is surrounded by upholstery fabric. Pouch for Storage: The back of the headboard includes a zippered storage pouch that includes all items needed for assembling the mattress. Quiet: This platform bed frame is designed to be quiet, and a padded foam tape is installed on the steel frame to help reduce noise. Variety of sizes available: The Zinus Upholstered Button Premium Platform comes in sizes from Twin to King. 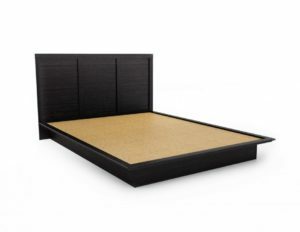 Warranty: This Zinus platform bed has a 5-year warranty available. If the Zinus Upholstered Button Premium Platform Bed is right for you, you can purchase yours on Amazon. The Nomad Plus Platform Bed is constructed with unfinished and chemical-free tulip poplar wood, wood support slats spaced 2.8 inches apart, and 4 sturdy legs to support each corner of the bed. This bed frame is made in the US, and is available in sizes from Twin to King Plus. It is compatible with innerspring, poly foam, or latex mattresses. The bed frame allows for under-bed storage, with 12 inches from the bottom of the support rails to the floor. It measures 15 inches tall, and weighs 83 pounds. Durability: The Nomad Plus Platform Bed is designed to last, and is constructed with unfinished tulip poplar wood with support slats that are 2.8 inches apart to offer sturdy support. Installation: Packaged in a small, compact shipping box, the Nomad Plus Platform Bed is easy and fast to assemble and simple to disassemble. Under-bed storage: There are 12 inches of under-bed storage available, and the space makes it easy to clean under the bed. Appearance: This Nomad bed frame helps raise profile of mattress, and its unfinished wood material adds to the bedroom design. Buyers can also stain or paint the unfinished wood if desired. Variety of sizes available: The Nomad Plus Platform bed frame is available in sizes from Twin to King Plus. Quiet: The Nomad’s stable construction and support for mattresses helps reduce noise. Warranty: The Nomad Plus Platform Bed includes a 5-year warranty. Made in the US: This bed frame is made in the US. Read customer reviews and purchase your Nomad Plus Platform Bed. The Olee Sleep T-3000 bed frame is a steel bed frame with steel support slats, designed to offer foundational support for mattresses including innerspring, latex, hybrid, and memory foam. The sturdy steel frame can support even the heaviest of mattresses. The Olee Sleep T-3000 is available in sizes from Twin to King. Although it is very sturdy, the steel is lightweight, and this frame weighs less than 50 pounds. There is 13 inches of space from the bottom of the steel rails to the floor, making under-bed storage possible. Durability: The Olee Sleep T-3000 bed frame is constructed with heavy duty steel, and is designed to last a long time. The steel slat platform is surrounded by a sturdy frame that provides stable support for mattresses. Stability: Mattresses are embedded into the steel frame, which prevents movement or sliding. This bed frame can support heavier, deluxe mattresses. Storage: There are 13 inches of under-bed storage available and the space allows for easy cleaning. 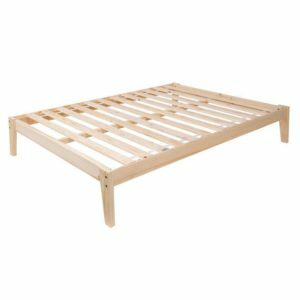 Installation: This Olee bed frame is shipped in a small, compact box, and is easy and fast to assemble. Its design makes the bed frame foldable, which makes transport and re-assembly easy. Warranty: The Olee Sleep T-3000 bed frame has a 5-year warranty. Headboard: Although the bed frame doesn’t come with a headboard, it is designed to allow for a headboard to be included. Get your Olee Sleep T-3000 bed frame today. 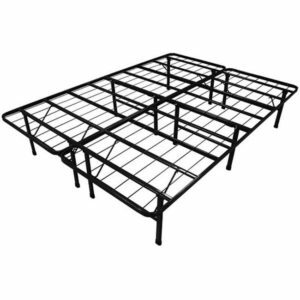 These top standard bed frames are all metal bed frames designed to pair with box spring foundations and serve as a sturdy foundation for both box springs and mattresses. Each bed frame includes head, foot, and side rails, and may include a few additional support slats. All of these bed frames were chosen for this guide based on research and data available from third-party sources, along with findings from consumer reviews. The Hercules Universal Metal bed frame is designed to be heavy duty and durable, and to support a mattress with box spring or foundation. This model can adjust to mattresses from Full to California King. The frame also includes 7 legs for added support with wheels that can be locked, along with a 2 ½ inch double center rail support bar. The side support rails are also adjustable and allow the bed frame to support heavier mattress and box spring sets. The bed frame weighs 26 lbs, and includes headboard brackets. 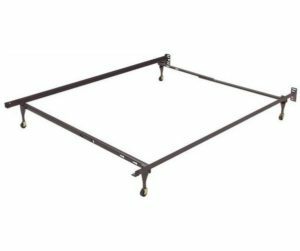 Durability: The Hercules Universal Metal bed frame is constructed with heavy duty steel and is designed to last a long time. 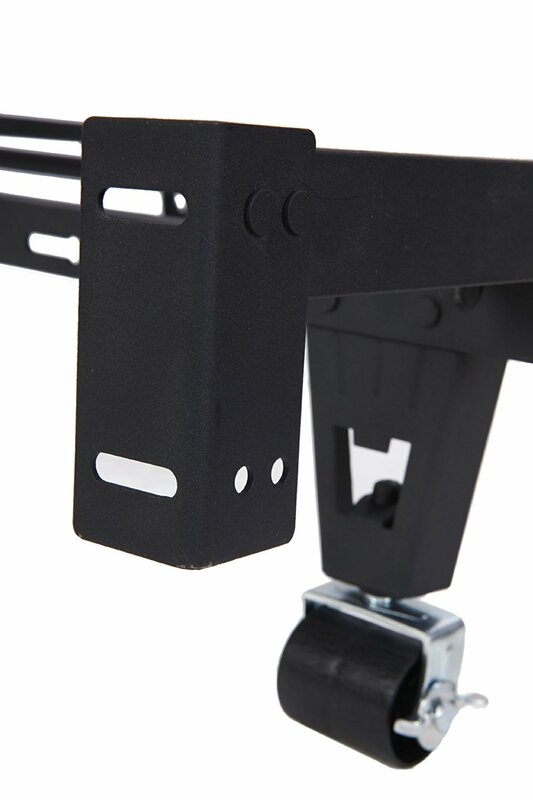 It also includes a steel center support rail to promote additional support and its lifespan. Stability: Roller legs are included on this Classic Brands bed frame and the 7 lockable wheels help to stabilize the bed in place. 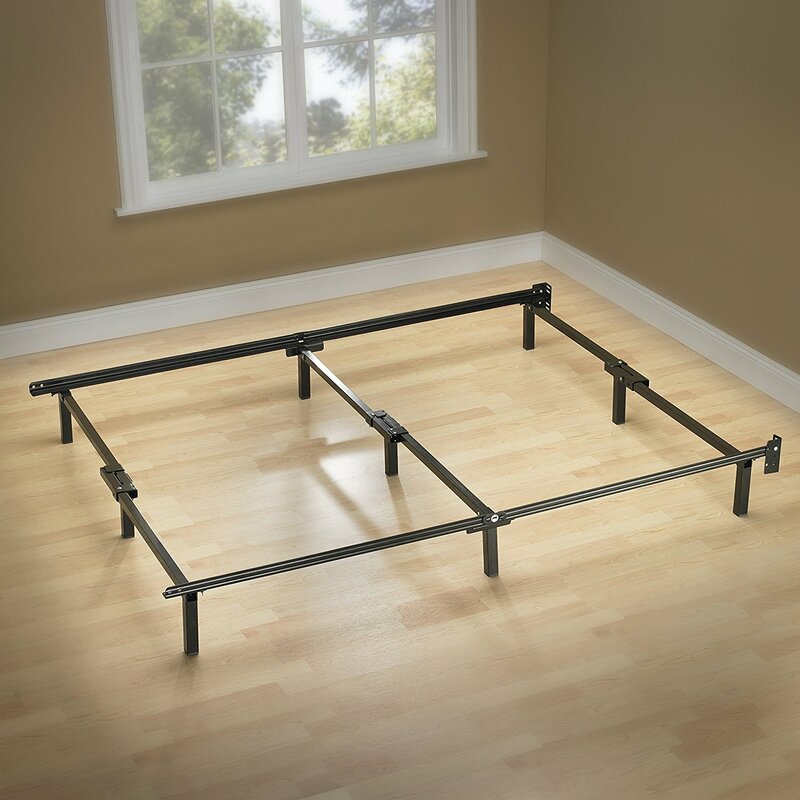 Installation: The Hercules Universal Metal bed frame is shipped in a compact box, and is easy to assemble, transport, disassemble, and store. No tools are required for installation. Under-bed storage: The space underneath this bed frame allows for ample under-bed storage. Adjustable: With this Hercules bed frame, one size fits all and the frame is adjustable for mattresses from full to California King. Low cost: The inexpensive nature of the Classic Brands Hercules bed frame is attractive, and adds value to this long lasting bed frame. Headboard optional: The Hercules Universal Metal bed frame also includes headboard brackets for easy installation. The Classic Brands Hercules Universal Heavy-Duty Metal Frame is available right now on Amazon. The Casper Sleep Bed Frame, although designed to pair with Casper Foundations, is compatible with other box spring and mattress sets. The frame is constructed with 100-percent recycled steel that makes up the support rails, and offers sturdy support for your box spring and mattress. Sizes available range from Twin to California King. The product is designed and assembled in the US, and is known for its quick and easy assembly with no tools required. It weighs 29 lbs. Durability: This metal bed frame is constructed with 100 percent recycled steel and should last a long time. It is also made with strong and durable plastic components made of polystyrene and polypropylene. 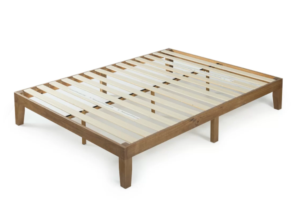 Made in the US: The Casper Sleep Bed Frame is designed and assembled in the US. Installation: Packaged in a compact shipping box, the Casper bed frame is easy to assemble, store, transport, and disassemble. No tools are required for installation. Different sizes available: The metal Casper bed frame is available for mattresses from Twin to California King. Purchase your Casper Metal Bed Frame on Amazon. The Zinus Compack 9-Leg Support Bed Frame was designed to be durable and easy to set up, and to be used with a box spring and mattress combo. 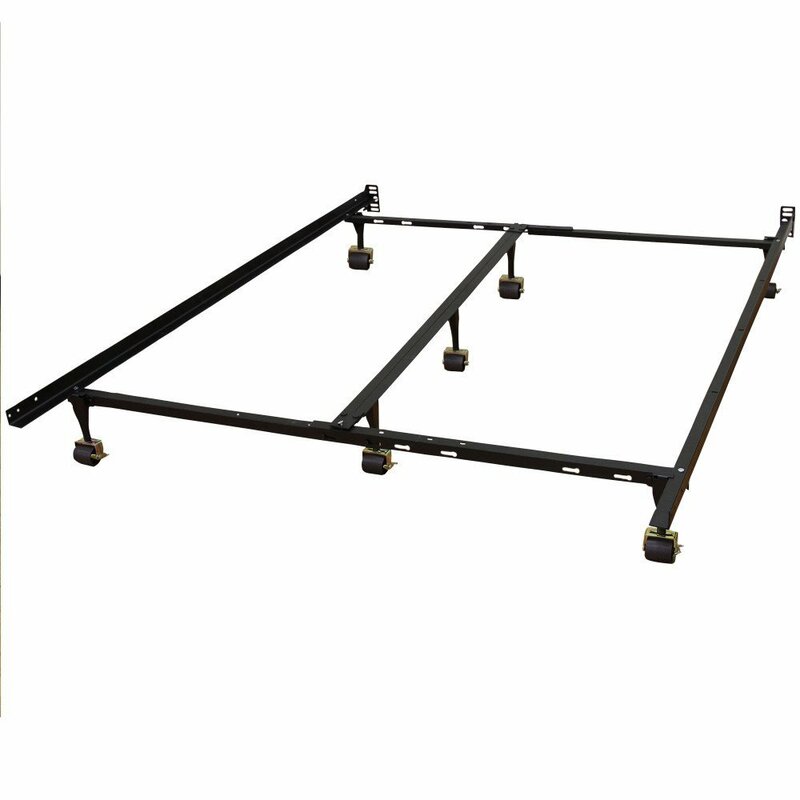 The bed frame includes head, food, and side support rails, and includes a center support bar. It is supported by 9 legs, which is unique to this model. Sizes available range from Twin to California King. No tools are required for assembly, and the bed frame includes a quick-lock system. Each support leg is recessed, to prevent sleepers from kicking the legs while moving around or making the bed. The bed frame weighs 21 pounds. Durability: The Zinus Compack Bed Frame is designed to last a long time, and is constructed with durable steel, including 9 support legs. Stability: A locking system is included with this Zinus bed frame, which helps stabilize the bed. Safety: The support legs are designed to be recessed so sleepers don’t hurt their feet when getting in and out of bed, or making the bed. Installation: The light-weight design makes installation fast and easy. Quiet: The added stability from 9 support legs, and the construction of this bed frame help promote reduced noise. Warranty: The Zinus Compack Bed Frame includes a 5-year warranty. Low price: When compared to many other standard frames, this option is one of the lower priced bed frames available. When you’re ready to purchase your Zinus Compack 9-Leg Support Bed Frame, head over to Amazon. 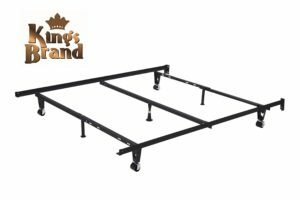 The King’s Brand Adjustable Metal Bed Frame is designed to be durable and sturdy, and is adjustable to fit box spring and mattress sets that are Queen, Full, Full XL, Twin, and Twin XL size. The frame includes two locking wheels, to hold the frame into place. This bed frame can also be used with a headboard, and weighs 31.2 lbs. Durability: The King’s Brand Adjustable Metal Bed Frame is designed to be durable and last a long time, and is constructed with solid steel support rails and 7 support legs. Stability: Locking wheels are included with this frame, and promote added stability. 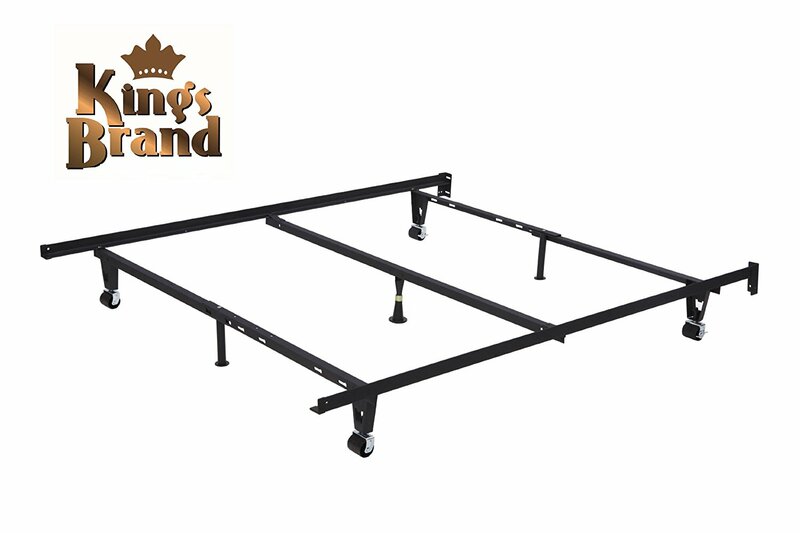 The King’s Brand bed frame also includes a center support bar for added support and stability. Installation: No tools are required to assemble this bed frame, and its design makes installation and transportation easy. Storage: The space under this metal bed frame allows for under-bed storage. Adjustable: This King’s Brand bed frame model is adjustable and will fit several sizes of mattresses ranging from Twin to Queen. 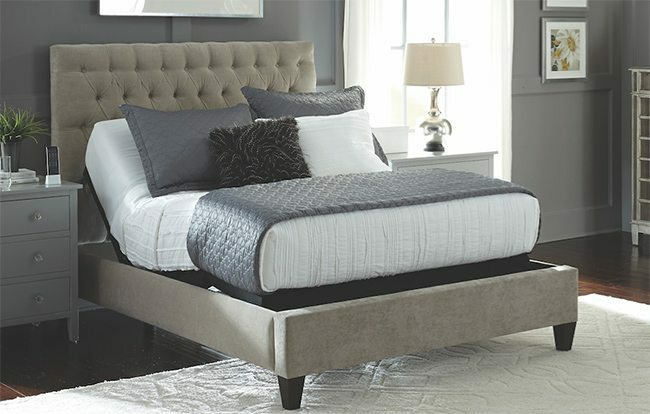 Headboard bracket optional: The King’s Brand Adjustable Metal Bed Frame includes headboard brackets. Purchase your King’s Brand Adjustable Metal Bed Frame from Amazon.